Reel Progress | The original site for low budget independent films est. Dec. 1996. 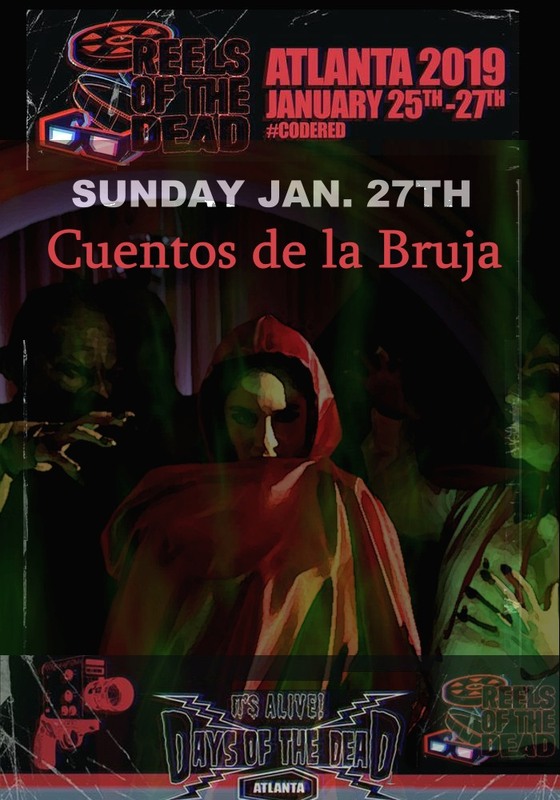 Days of the Dead horror convention kicks off in Atlanta, Georgia this weekend and their concurrent film festival REELS OF THE DEAD will be showing Mike Lyddon’s latest feature film, a Spanish language horror anthology titled CUENTOS DE LA BRUJA (Witch Tales) on Sunday afternoon during the Foreign Films block. This film will be presented with English subtitles. Please visit the official Days of the Dead website for more info, and if you’re in the Atlanta area and crave a great horror convention with guests Clive Barker, Sid Haig, Tony Todd and many more, head on over to the Sheraton Atlanta and get in on all the bloody action this weekend! The latest horror anthology movie from Mike Lyddon and Reel Progress LLC picked up an honorable mention for best feature length film at INFIERNO EN LOS ANDES film festival in Puno, Peru. Lyddon was on hand for the festivities which included dozens of international short films and several features from around the world. “It’s the kind of festival where you can talk with the fest directors and everything has a very personal feel to it. Puno is a great town and an excellent place for a genre event like this. We has some tough competition from films with budgets far, far greater than ours, so I am pleased that CUENTOS DE LA BRUJA walked away with an honorable mention,” said Lyddon. Buy the Horror Anthology Movie DVD and get a second copy FREE! Limited time offer now through Halloween. Makes the perfect gift! 6 Tales of Terror…approx 2 hours of indy horror thrills and chills! Starring Ben Matheny (AHS – Coven), Roy “Rusty” Jackson, Jr. (First Man on Mars), Brian Lanigan and many more! Here is the first trailer for the spanish version of Witch Tales called “Cuentos de la Bruja,” written and directed by Mike T. Lyddon The movie was filmed in two languages on the same set using a bilingual cast thus giving us the film in both spanish and english. Witch Tales is a horror anthology film based upon pre-code horror comics of the 1950’s, similar to Tales from the Crypt. We will have the english version of this trailer by the end of the year, and both versions will be on the film festival circuit for much of 2019. For more info please visit Horror Anthology Movies website. Fiorella Vergel, Erick Lopez and Raul Chamorro as the eccentric Dr. Emil Chadwick. The second segment of the feature length indie horror anthology movie WITCH TALES starring Raul Chamorro, Erick Lopez and Fiorella Vergel has wrapped shooting and production is underway on the third segment. Director Mike Lyddon has confirmed that the film is scheduled for a theatrical premiere in October, 2018. This feature is being shot simultaneously in both english and spanish for a wider world market. Please visit Horror Anthology Movies official site for further details. The feature length horror anthology movie Witch Tales starring Mayella Lloclla and directed by Mike T. Lyddon is now filming in Lima, Peru. The film is being shot simultaneously in english and spanish and in production through June, 2018 with a planned limited theatrical release set for October of 2018. From the early days of shooting short super 8 films in the Antelope Valley to his latest feature film FIRST MAN ON MARS (2016), indie filmmaker Mike T. Lyddon or Reel Progress LLC discusses the ins and outs of shooting no-budget features, movie critics, and his love for doing special make up effects, sound tracking and other aspects of filmmaking not typically handled by the director himself. Read the whole damn interview right here. Reel Progress is pleased to announce that FIRST MAN ON MARS is an official selection at the Mad Monster Party Film Festival coming this weekend, March 24th through 26th in Rock Hill, SC. Among the many events and special guests featured at the event, the indie sci-fi comedy First Man on Mars from filmmaker Mike Lyddon will be screening Saturday, March 25th at 2pm. 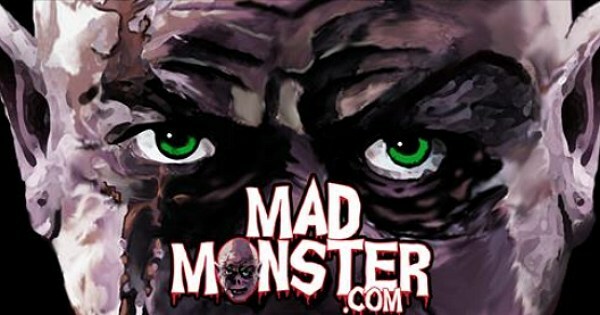 For more details please visit the official Mad Monster Party website. 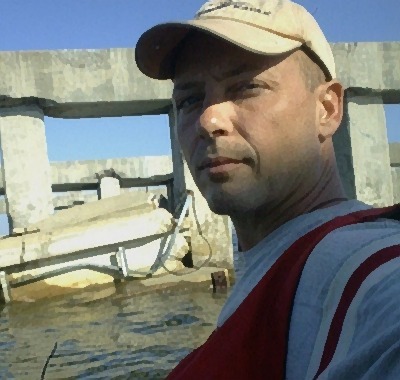 Find more info on Mike Lyddon and his films HERE. 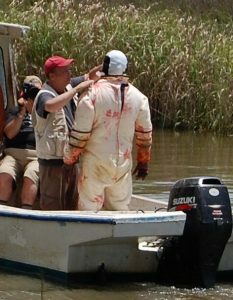 Director/make up FX artist Mike Lyddon makes some adjustments to the monster (Benjamin Wood) on the set of FIRST MAN ON MARS. Misty Layne from Rogue Cinema offers up the latest interview with Mike T. Lyddon, the founder of Reel Progress which celebrates 20 years online this month. Lyddon talks about his newest feature, the low budget indy flick First Man on Mars as well as his forthcoming, two country spanning opus, HELLPACA! which begins filming in late 2017. Click Here to watch the First Man on Mars trailer.